I disagree with that analysis, for two very simple reasons. When Lehman was allowed to go bankrupt, a signal was sent to all, saying that not everybody will be rescued. This was in direct contrast with the Japanese Government’s decadal efforts to prop up every financial institution under its watch (that’s why those efforts lasted for a decade or even more). More importantly, the failure of Lehman Brothers showed everybody what the failure of “just a bank” may mean, with innumerable, overwhelmingly negative consequences propping up even in unlikely places. And this was good: because it is in the human nature to seriously question people advising that something bad may be happening in the near future, and to need a direct experience of that “something bad” before properly reacting. You can spend every last molecule of your breath explaining a child that eating too many sweets can be painful. But there is nothing like going through a “tummy ache” that will convince the child of changing their way. And you could transfer yourself back to January 1939 and explain all the reasons for the upcoming Nazi continent-wide monstruosity, but I am sure nobody in the UK or France (or the USA) will agree to go to war until forced to by the pain of circumstance. And so, had Lehman Brothers been rescued alongside the other relatively large institutions, we would still be discussing the pro’s and con’s of rescue packages. And we would have never known that it takes just a bank to fail, to see a run on money-market funds. 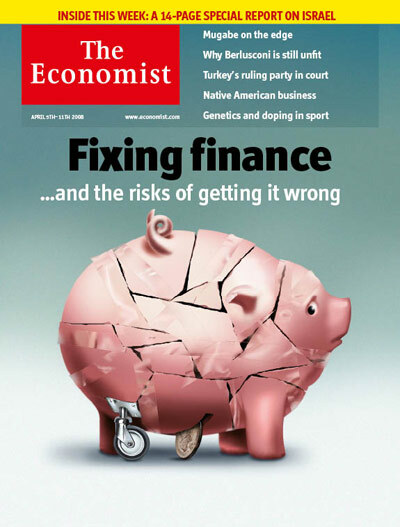 Mai finire di stupirsi: adesso e’ dalle pagine dell’Economist che si puo’ leggere che (1) la vera crescita in benessere e’ piu’ legata al PIL (Prodotto Interno Lordo) pro-capite che al PIL assoluto, per cui la diminuzione della popolazione non e’ per forza un dramma da evitare a tutti i costi (anzi! ); e (2) per assicurarsi contro l’apocalisse finanziaria, invece che comprare divise o rifugiarsi nell’oro, la cosa migliore da fare e’ acquistare terreni agricoli. The Economist: Does Charlemagne Speak Any French? The author of the “Charlemagne” column makes quite a fuss about the alleged ability in EU documents for fish to “fish themselves” (“A fishy tale“, Dec 13). The actual ploy though appears to be based on “Charlemagne“‘s own challenged relationship with the French language. Far from being “daring“, “passive impersonal” (or “passive reflexive”) is a very common construct in French and in other languages, with the reflexive pronoun “se” used to avoid the seldom-liked standard passive voice. No French speaker, and nobody but a person with plenty of negative prejudices against the European Union, would have imagined that anybody had ever suggested that “the fish had fished and sold themselves“. If you have something to criticise about the EU (and there is plenty of material in that respect!) could you please at least make an effort not to concoct baseless innuendos.